From jleonardi of Redondo Beach, California on 2/22/2019 . I have used these backpacks for the past three years on a daily basis while riding a motorcycle. They provide very effective high visibility when riding. Family members have followed me from locations and commented on the high visibility over long distances. I have not had any failure of zippers or materials. The bags are durable and have allowed me to carry numerous items with significant weight. My only reason to buy additional backpacks was to be able to rotate and clean them after they were dirty from extensive freeway driving in all conditions. From Anonymous of Redondo Beach, California on 1/23/2017 . 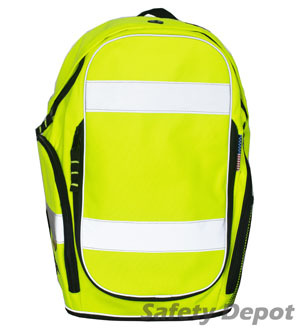 This backpack is very well made, and it provides maximum visibility. I have been using the first one daily for over a year commuting over fifty-five miles a day on a motorcycle. It is not showing any wear or damage after the first year. This is the second one that I have purchased so that I can use one for hiking and bicycling and one for commuting. From Eerodynamic of Berkeley, California on 5/31/2016 . The "safety backpack" has been perfect for me as a bicycle commuter. It provides a lot of space for my work and exercise gear, it really provides a lot of visibility to the traffic I'm working with daily. It just a matter of drivers wanting to pay attention to what's all around them. The only things I would suggest for Safety Depot to make this pack even better is to provide a chest strap for more stability (I made my own) and one or two more pockets inside with zippers for more organization and protection. I would suggest that Safety Depot also advertise this backpack in bicycle stores. The four stars is provided because I haven't had the chance to see how water proof my gear is. Over all, I'm very happy with my purchase for quality and price of my order. From Anonymous of Houston, Texas on 9/30/2015 . Very nice, durable bag. Worked very well for our field crew to carry their tools and bright color so they would not forget or loose it. Will purchase more in the near future.